Lose 20 to 35 Pounds in 6 Weeks ~ Dr. Supervised, All Natural, No Shakes, No Exercise, No Pre-Packaged Foods! Subject: LongIsland.com - Your Name sent you Event details of "Lose 20 to 35 Pounds in 6 Weeks ~ Dr. Supervised, All Natural, No Shakes, No Exercise, No Pre-Packaged Foods! " Are you tired of struggling to lose weight? Are you starving yourself, drinking chalky shakes, eating frozen processed foods, snacking on tiny bars, exercising daily and still not losing a pound? Have you tried every fad diet out there, only to gain back all the weight you’ve lost? If you answered yes to any of these questions, then it’s time to try ChiroThin!! A 6 Week, doctor supervised, all natural, weight loss program that actually works and provides long lasting weight loss results. Call today to set up a FREE consultation and find out if ChiroThin is right for you!! 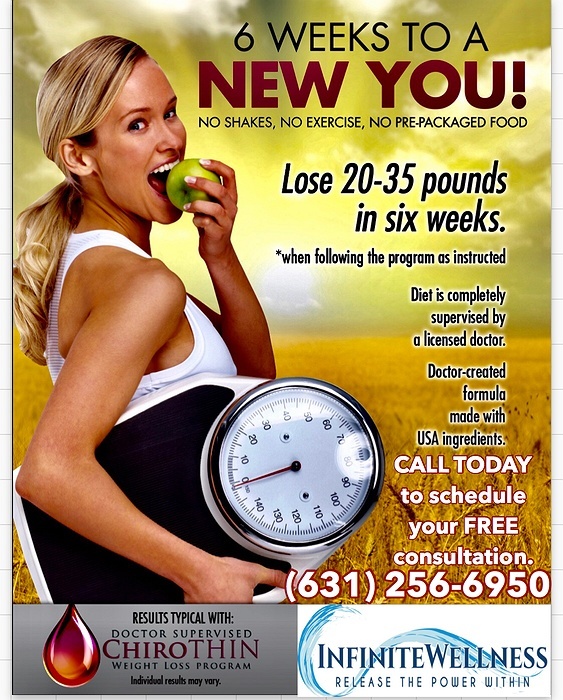 We are here to help you lose weight, get healthy, and be the best you can be! !